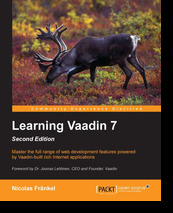 Announcement: Learning Vaadin 7 is released! Get it now from Packt, Amazon, Barnes and Nobles or Safari Books Online! During the writing of Learning Vaadin, I had many themes I wanted to write about. Unfortunately, books are finite in space as well as in time and I was forced to leave out some interesting areas of Vaadin that couldn’t fit in, much to my chagrin. This site is meant to gap the bridge between what I wanted and what I could. Expect to see articles related to Vaadin!